This Alex Lifeson is in excellent condition! 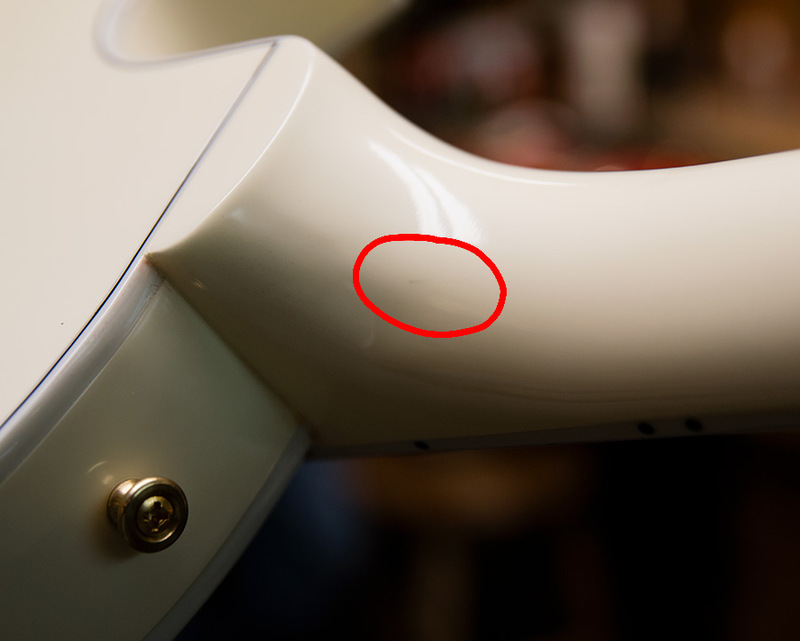 It only has one extremely tiny spot in the finish on the back of the neck near the heel. Includes the original hardshell case and COA. As one third of the band Rush, Alex Lifeson can reasonably claim to have induced more head banging to odd time signatures than any other guitarist on the planet. Few mortals could keep up with virtuosos Neil Peart and Geddy Lee, but Alex Lifeson is no mere mortal! He's a rock and roll warrior that descended to Earth from Valhalla with one goal in mind: to bring prog rock to its ultimate pinnacle (don't fact check me on this). Throughout Rush's four-decade history, Lifeson's guitar work has added both brawn and brains to the group's music. His power chord riffage brings a needed dose of thunder to the group's more cerebral work, and his sophisticated harmonic sensibility, tasteful melodic leads and textural work have helped keep Rush's music hooky and delightful enough to dominate classic rock radio. And, of course, it is nearly impossible to hear one of his solos and not air-guitar along! There has been one other constant through Lifeson's career: tone. Even on Rush's self-titled debut album, you can hear that Lifeson had the secrets of crafting a glorious rock guitar tone figured out. His dirty tones are thick, crunchy, and muscular, but they remain three-dimensional and open, while his clean sounds are warm, lush and clear. The man knows tone, and that's why we are so excited about the Alex Lifeson Signature ES-Les Paul! Let's take a closer look and see why this semi-hollow Les Paul is worthy of one rock and roll's greatest kings of tone. The Alex Lifeson Signature Les Paul is a fusion of two of Gibson's most timeless models: the Electric Spanish semi-hollow, and the solid-body Gibson Les Paul. For many years, Alex Lifeson used a sweet white ES-355 as his number one. However, he's also been known to sport a low-slung Les Paul. So, the team at Gibson figured they should combine the two into one guitar. The result? 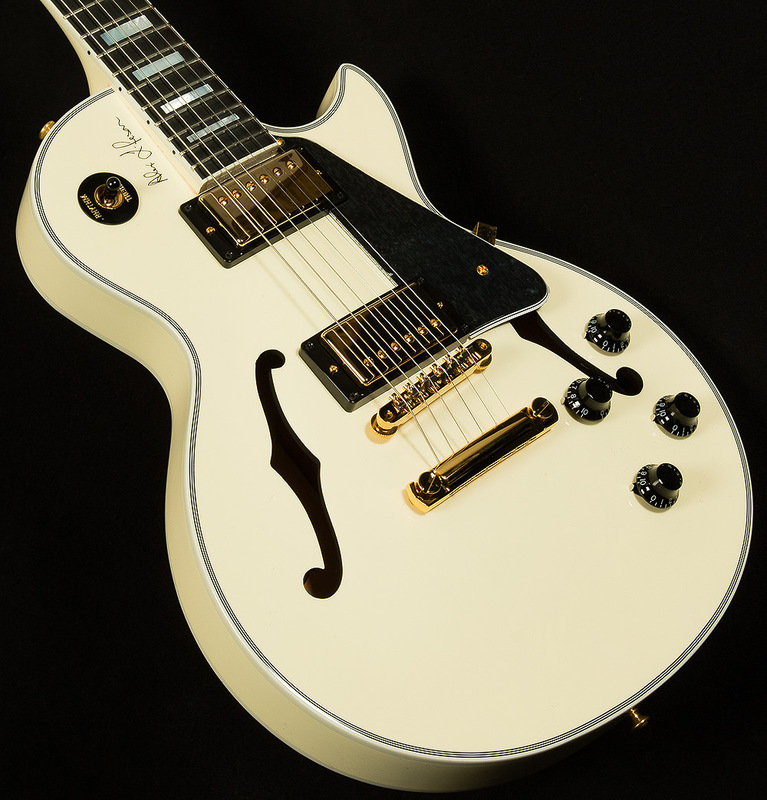 A perfect mash-up of Les Paul swagger and semi-hollow sweetness. Every great guitar starts with great wood, and nothing is closer to the heart of the Alex Lifeson signature than its thermally-engineered mahogany center block. 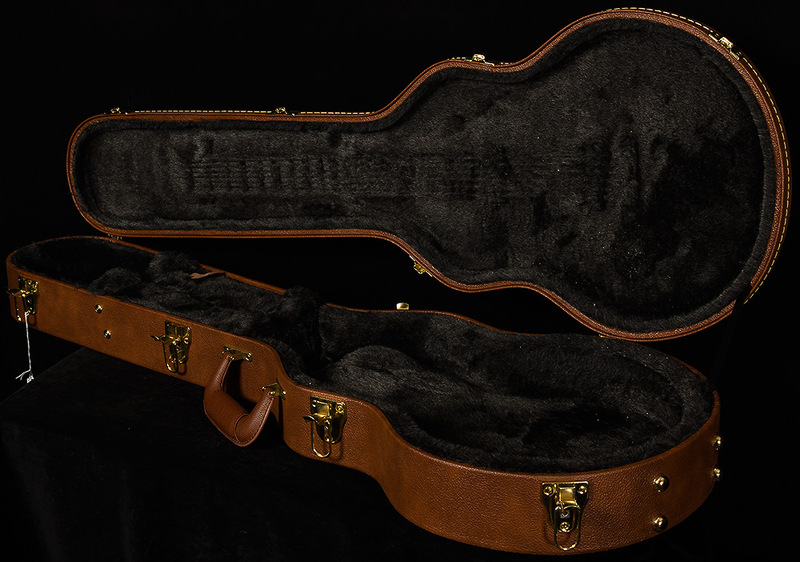 Most Gibson ES-series guitars have a maple center block, which gives them more of a cutting, bright high-end. By contrast, mahogany imparts more roundness and warmth. The thermal engineering process also gives the sound a bit of vintage-style woody flavor. Overall, it helps gives the Alex Lifeson signature a more midrange-forward sound than many semi-hollows, and as any recording engineer will tell you, midrange is a crucial ingredient to a great guitar sound. Next to this mahogany heart, the thermally-engineered quartersawn Adirondack spruce bracing does a lot of heavy lifting. Adirondack spruce bracing is a perpetual favorite among Wildwoodians, and its inspiring timbre is on full showcase here. It helps make the attack more articulate, and it allows the high-end to remain open and clear thanks to its sky-high levels of headroom. So, right off the bat, the Alex Lifeson Signature model has an inspiring unamplified sound. Things only get better when you plug in, because this sucker is equipped with two Memphis Historic Spec humbuckers! These slightly-underwound pickups emulate the sound of vintage PAFs, and they do an absolutely stellar job! The bridge position has plenty of quack, chime and sparkle in the high-end above thumping bass and muscular midrange. By contrast, the neck pickup has deep, thick lows to go with forceful low mids and sweet, pure, singing high end. So, the Alex Lifeson Signature will punch right through a mix, but it's not a cutting, edgy sort of sound. It remains round and musical when the gain gets turned up. Also, its spacious, three-dimensional highs allow it to fill up plenty of space, but its warm, woody voice keeps it from sounding overbearing. So, while this guitar can handle Rush-esque rock riffage with the best of them, it's not a one-trick pony. It has the sort of versatile tonality that will follow you on whatever genre-bending adventures you embark upon! The true test of a signature instrument isn't whether or not it replicates the player's signature sound and vibe. 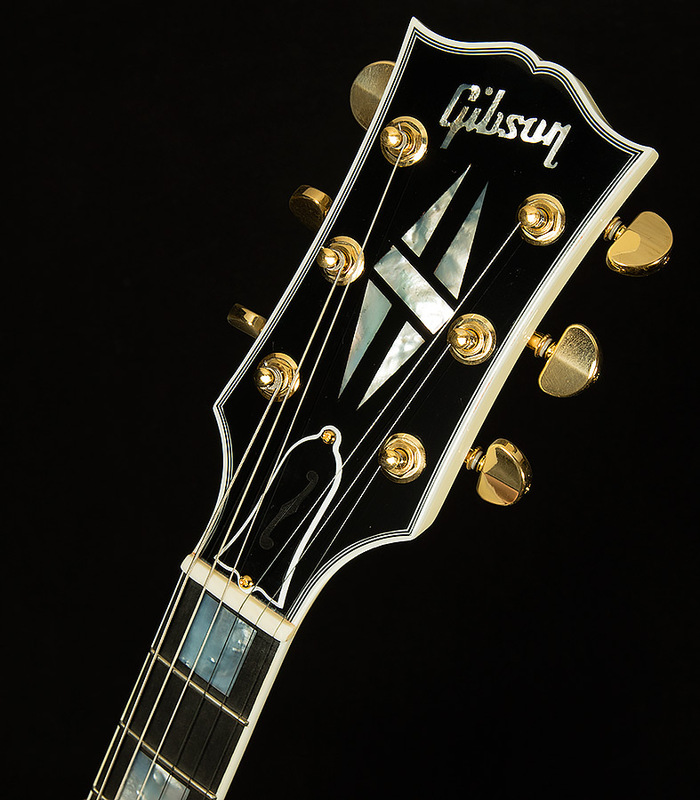 Gibson has managed to do that so many times over the years that we expect that brand of excellence from them. Here, they have managed to meet our lofty expectations by building a guitar that captures Alex Lifeson's sound so well that plugging it in feels like stepping into a Rush record that hasn't been written yet. By itself, that would be an amazing feat. But, the true test of a signature model is whether or not it furthers your own creative endeavors by inspiring you to take your own playing in exciting new directions. Gibson has managed to imbue the Alex Lifeson Signature with the sort of trailblazing spirit that led Rush to write rock radio anthems in 7/4 and 13/4 and conquer the world with heady concept albums full of complex riffs. We are proud to showcase such an inspiring instrument for our exceptional customers, and we can't wait to see what magic your fingers will unleash as they fly up and down its fretboard.